Are you interested in deepening your practice? Our lesson study will focus on the process of delivering effective mathematics lessons with a focus on content and delivery. Teachers work as a member of a professional development community by planning, delivering, reflecting and refining lessons for grades 1- 3. This collaborative model will establish a community that desires to learn from each other and grow under the mentorship of Dr. Yeap Ban Har & Sarah Schaefer, M.Ed. This institute is designed for teachers who have implemented Singapore Strategies in the classroom for at least one year. Topics will challenge all grade levels and equip teachers with ways to meets various student needs within the classroom as they implement the 3-part lesson approach across a variety of concepts. With time to explore the CPA (concrete->pictorial->abstract) approach when working through traditionally challenging topics, teachers are able to immerse themselves in the concepts of math where deepening understanding poses the greatest challenges. Dr. Yeap Ban Har and Sarah Schaefer co-teach this course each summer so that teachers may jump into their fall lessons with renewed enthusiasm for meaningful mathematics instruction. 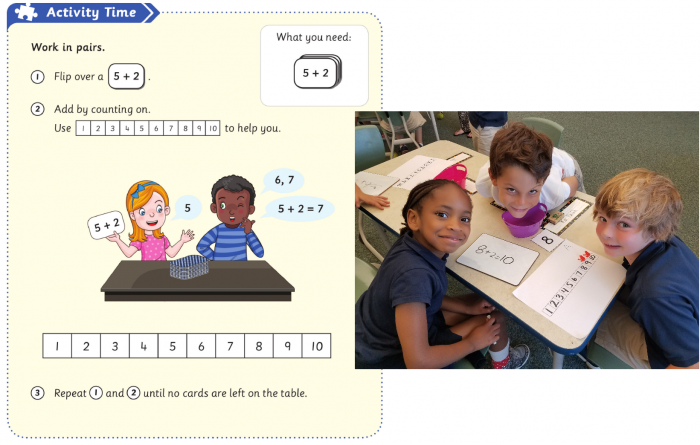 Students using the think!Mathematics program reinforce the count on strategy. Games/activities can be used during the guided practice part of a lesson. Students are encouraged to count on from the larger number. This institute is designed for teachers who have implemented Singapore Strategies in the classroom for three years or less. Topics will challenge all grade levels and equip teachers with ways to meets various student needs within the classroom as they implement the 3-part lesson approach across a variety of concepts. With time to explore the CPA (concrete->pictorial->abstract) approach when working through traditionally challenging topics, teachers are able to immerse themselves in the concepts of math where deepening understanding poses the greatest challenges. Dr. Yeap Ban Har and Sarah Schaefer co-teach this course each summer so that teachers may jump into their fall lessons with renewed enthusiasm for meaningful mathematics instruction.